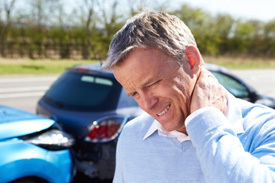 At Capps Chiropractic Clinic one of our specialties is caring for those who’ve been injured in a car accident. Get help today if you’ve been hurt in an accident! We evaluate the extent of your injury through examination, testing and medical imaging. We initiate palliative modalities (therapies to make you more comfortable) to decrease your pain and reduce inflammation. We introduce rehabilitation therapies to start the process of healing: restoring function and mobility to your body. We have an excellent reputation in the community in the area of accident injuries…and we pride ourselves on the many satisfying attorney relationships we’ve cultivated over the years, particularly in cases of liability. Attorneys appreciate the fact that we always provide them with proper medical information and documentation to assist them in their representation of our patients. Even if you’ve never seen a chiropractor before, we urge you to get the necessary help that you need in the case of an accident/injury. Don’t allow the pain you feel today to turn into a permanent reality! Call us today!